Washington, DC — The latest research from the Violence Policy Center (VPC) reveals the dangers of a recent federal court ruling that denies California law enforcement the discretion to limit who can carry concealed handguns in public. The VPC’s online database, Concealed Carry Killers, shows that private individuals with concealed carry permits are frequently responsible for fatal shooting incidents that have nothing to do with self-defense. Nationwide, private individuals legally allowed to carry concealed handguns are responsible for at least 636 deaths since May 2007 — including 27 mass shootings that resulted in the deaths of 128 victims. A February ruling by a panel of the U.S. Court of Appeals for the 9th Circuit removed the ability of California county sheriffs to restrict concealed carry to those individuals who could demonstrate a “good cause” for carrying loaded weapons in public. The California Attorney General is asking the full court to review and reverse the panel’s decision in Peruta v. County of San Diego. Concealed Carry Killers documents hundreds of examples of fatal incidents perpetrated by private individuals legally allowed to carry concealed handguns. Because there is no comprehensive recordkeeping of deaths involving concealed handgun permit holders and many states in fact bar the release of such information, the examples on the Concealed Carry Killers website are taken primarily from news reports and most likely represent only a fraction of actual events. The database includes 475 incidents in 36 states and the District of Columbia since May 2007, resulting in 636 deaths involving private citizens legally allowed to carry concealed handguns. In the vast majority of the incidents documented (395, or 83 percent), the concealed carry killer either committed suicide (189), has already been convicted (153), perpetrated a murder-suicide (39), or was killed in the incident (14). To date, Concealed Carry Killers has documented only two fatal incidents involving California concealed handgun license holders — a strong indication that stricter concealed carry policies save lives. Of the 65 cases still pending, the vast majority (55) of concealed carry killers have been charged with criminal homicide. Four were deemed incompetent to stand trial, and six incidents are still under investigation. An additional 15 incidents were fatal unintentional shootings involving the gun of the concealed handgun permit holder. The 475 incidents do not include any that were ruled as self-defense. 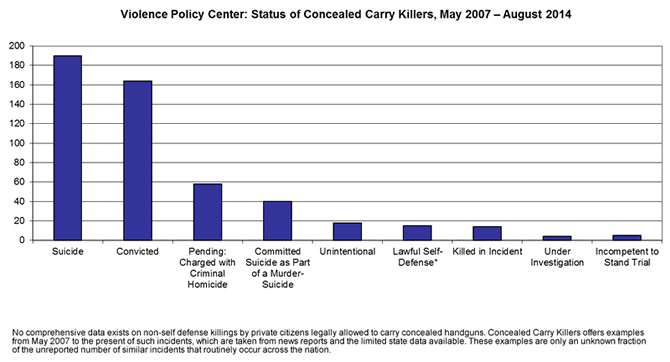 Only 14 of the hundreds of examples tallied in Concealed Carry Killers were eventually deemed lawful self-defense. Such cases are then removed from the site’s ongoing totals.